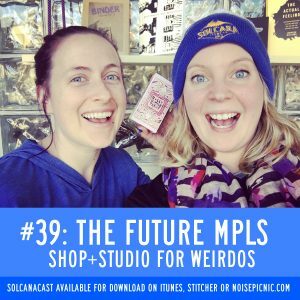 Continuing the witchy goodness from last week, Lucia and Hannah interview shop owner Lacey at The Future MPLS, a new and very good energy shop, studio and residency space all rolled into one in the witch district of Minneapolis, specializing in offering goods from crystals, hand printed cards, tarot decks to hand-crafted smudge sprays. Listen now to get the details on how this space for weirdos will keep growing, and what Hannah and Lucia experience as they explore! Catch new episodes of Solcanacast Mondays via noisepicnic.com, iTunes or Stitcher! And don’t forget to holler at us over on facebook with your questions, suggestions and ideas for where you want us to go next!